Saturday afternoon turned out to be a magnificent day for Bike Fun. Twenty Poky Pedalers turned out for the Poke Around Ride – East of I-39. This was an opportunity to see that the neighborhoods north and south of the Hwy 10 business corridor provide calm streets for bicycling with a great deal of nice scenery, peppered with several interesting landmarks. We ended up riding a 14-mile loop starting from Iverson Park. Our initial access to the east side of I-39 was on the extremely poor bicycle infrastructure using the sidewalk along the south side of Hwy 10. This half-mile stretch is easily the biggest gap in the bicycle network of the Stevens Point urban area, with substandard widths for bicycle travel and complex intersections designed almost exclusively for the convenience of motor vehicle traffic. Nevertheless, by patiently walking our bicycles across the intersections and otherwise bicycling slowly and carefully along this sidewalk, the neighborhoods behind Target can indeed be safely accessed. The remainder of our Poky Pedal was much more pleasant and relaxing and allowed us to explore these neighborhoods. Below are highlights from among the interesting things we encountered. Why is there a reference to a two-‘L’ Brillowski family on one-‘L’ Brilowski Rd? What does the Stevens Point Water Dept have to do with this? Why is there a stone marker here at all? This marker is all the more mysterious upon realization that hundreds of vehicles pass by this marker on Brilowski Rd daily, yet only a small percentage realize it is there and a select few have any idea what this marker is all about. I shared the story of this stone marker for the Poky Pedalers present. Our Bike Fun in the retelling of this story was enhanced due to having a descendent of the one-‘L’ Brilowski family present on our Poky Pedal, who was able to confirm the accuracy of my research. Frank Brillowski’s father was a German immigrant named Stanislaw Brilowski or Bryllewski, although other spellings were also used. Born in 1865, Stanislaw passed away in 1899 at the young age of 34. Stanislaw had married Pauline Meyers, who was the daughter of Polish immigrants who purchased farmland near the Plover River near current-day Brilowski Rd. At the time of Stanislaw’s death, he and Pauline had 7 children, and Frank was the second oldest. As was apparently customary after the father of minor sons passed away, the 4 sons took on the surnames of their choice. Frank chose the spelling Brillowski, with 2 ‘L’s. However, his younger brother Joseph chose the spelling Brilowski, with 1 ‘L’. Joseph chose to remain on his grandparents farm and eventually started the J.T. Brilowski and Sons Dairy. This grew into a successful business that still sells farm equipment today. Brilowski Rd was named for this branch of the family. But the stone marker is on the homestead of Frank and Cecelia Brillowski, spelled with 2 ‘L’s because Frank chose a different spelling from his brother Joseph. Frank passed away in 1954 and his wife, born in Stevens Point as Cecelia Domaszek, passed away in 1963. As for the Stevens Point Water Dept, that part of the story is told in a brief passage in a routine account of city business published in the Stevens Point Daily Journal on December 14, 1965. Two years after Cecelia’s death, the Water Dept purchased 79 acres from the family estate as a buffer for protecting the city water supply. 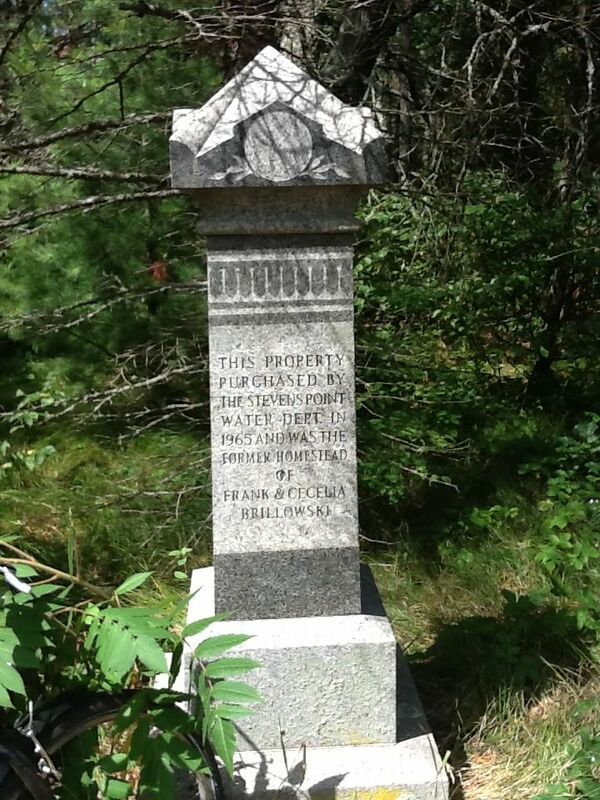 As part of the deal to purchase the land, the Water Department agreed to erect a marker on the property in memory of Frank and Cecelia Brillowski. So, this is the marker erected out of that agreement almost 50 years ago. And this explains the mystery behind the unusual two-‘L’ Brillowski stone marker on one-‘L’ Brilowski Rd. We stopped to admire what might possibly be the most artistic chimney in the Stevens Point urban area. 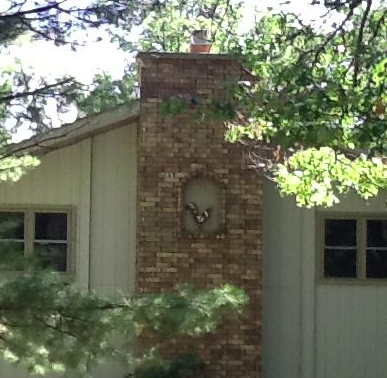 Built into the brick chimney of a house in the neighborhood south of Old Hwy 18 is a statue of a rooster. It is hard to tell whether this statue is made of metal or concrete or some other material, but it is an appreciated artistic touch to our urban fabric. It is a little known fact that a Field of Dreams is present right here in Stevens Point. 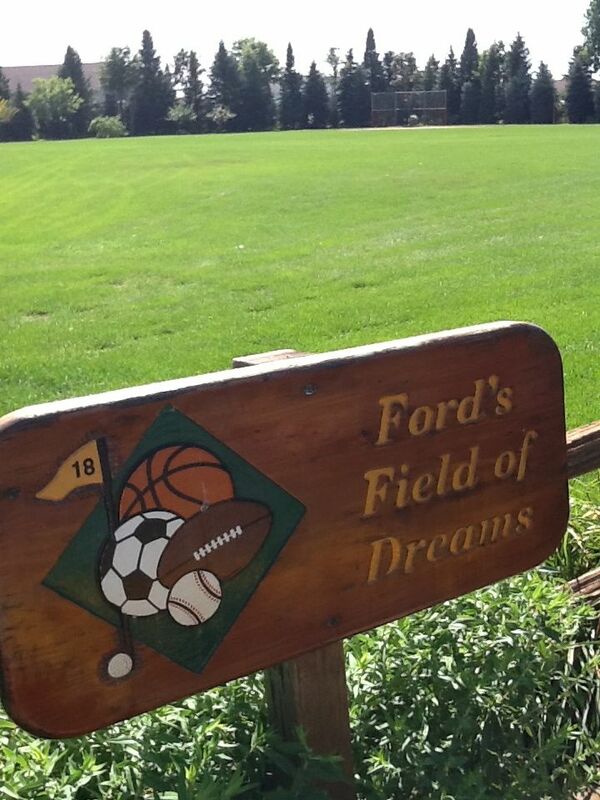 As part of our Poky Pedal, we discovered Ford’s Field of Dreams, a large open area for athletic activity identified by a very attractive sign. I presume this Field of Dreams is privately owned by the family living in the house abutting it. Many people travel within the Portage County Business Park and are familiar with a road commonly understood to be named Business Park Dr. 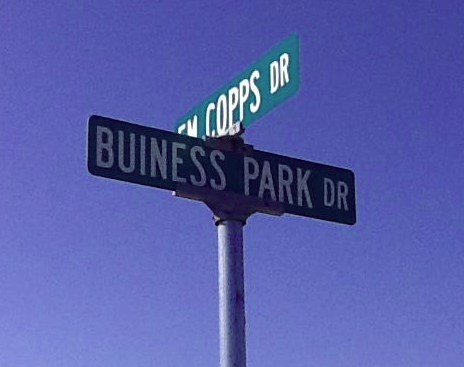 But according to a street sign we encountered, this street is apparently named Buiness Park Dr, with no ‘S’ between the ‘U’ and the ‘I’. The story of this spelling/naming remains a mystery. Our loop ride used the excellent Heartland Trail under I-39 to travel from the Portage County Business Park to Joerns Rd on our way back to Iverson Park. This path is largely due to the efforts of the local Heartland Bike Club in getting cooperation and funding from several governmental entities as well as the Canadian National Railway. Poky Pedalers heard the story of their efforts to make this path a reality. After a 5-year push, the path was completed in the summer of 2010 and was named the Heartland Trail in honor of their efforts. These were the highlights, but we enjoyed much more Bike Fun throughout our Poky Pedal. Poky Pedalers again experienced how our urban area provides an abundance of places for simply riding around on bicycles and having great Bike Fun. There are still a few Poky Pedals remaining on the 2013 Bike Fun Calendar. You can view the full calendar here. A bit more info can be found on the Upcoming Poky Pedals page here. Make your plans to share as much Bike Fun as you can with PPSP.